Come visit, see our Sortation Systems in action - in person. Come and see our material handlers in action. We have two on-site demos here at Mantissa that have a few different chute types and multiple tray sizes. These demos are designed mainly for our DC customers, but don't fret because our airport demo is just across the street. There are several fully installed and operational customer sites nearby. If you are planning a visit to Mantissa, we could schedule a visit with one of our clients to give you a tour. Two of the local installations available for a visit are Spencer Gifts and Phillips Van Heusen. We also have an integration project with Pteris very close-by. Give us a call at (704)525-1749 to schedule a visit. Getting to any section of Charlotte isn't hard from our office on Pressley Rd. We know a lot about this city so feel free to ask where the local hot spots are. Most of them are actually a short drive up the street. 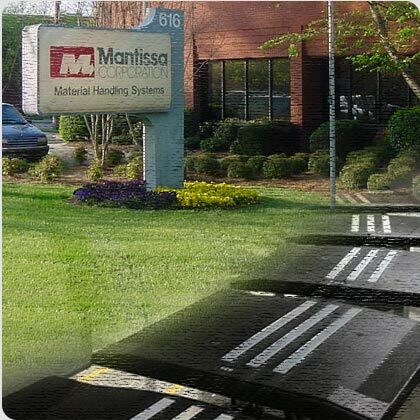 Mantissa Corporation is located in Charlotte, NC near Charlotte-Douglas International airport. On the map to the right you will see that our office is closest to I-77, but has quick access to all highways in Charlotte. 1. Go EAST on RC JOSH BIRMINGHAM PKWY toward OLD DOWD RD. 2. Take the BILLY GRAHAM PARKWAY SOUTH ramp toward I-77. 3. Merge onto BILLY GRAHAM PKWY/US-521 S.
5. Turn LEFT onto PRESSLEY RD. 616 PRESSLEY RD is on the RIGHT.